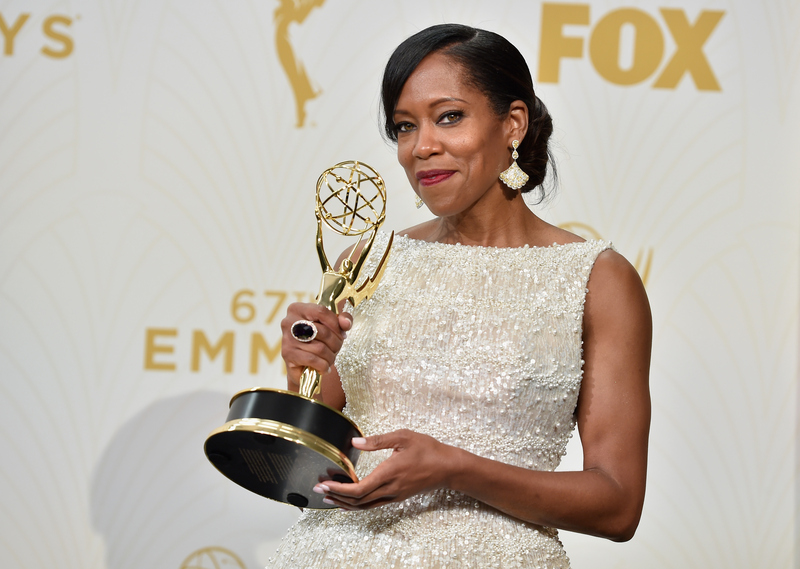 Last September, it came as a bit of a shock when Regina King took home an Emmy for her performance as Aliyah Shadeed on ABC's American Crime. American Horror Story: Freak Show's Sarah Paulson was considered to be a lock in the Supporting Actress in a Limited Series category, but King was ultimately the winner, which even surprised the actor herself. As American Crime Season 2 approaches, her performance as a new character is definitely something to look forward to, and this time around, the whole cast may be more prepared for awards recognition. As King explains in an interview with Bustle, when they first signed onto the series, they didn't really consider the type of acclaim it would receive. "I think everyone would agree, when it comes to using that word 'Emmy-worthy material,' we don't really know what that is," she says. "But as far as feeling like it was something special? Absolutely." King gives the lion's share of the credit for that to creator John Ridley, the Oscar-winning screenwriter behind 12 Years A Slave . "I actually didn't come aboard until the third episode," King says of joining American Crime. "When they reached out to me about doing the show, they sent the pilot for me to see, but they had not sent a script. So I watched the pilot and I was just floored. I felt like I wanted to know more about these people, I wanted to know more about this crime, I had this sinking feeling in my stomach — all of those things that are the reasons you go to the movies or watch a show." Like FX's American Horror Story or HBO's True Detective, American Crime is an anthology series, so it will be telling an entirely new story in Season 2. It will also retain much of its main cast for the second iteration. In addition To King, stars Felicity Huffman and Timothy Hutton are both back, as well as supporting players Richard Cabral, Lily Taylor, and Elvis Nolasco. Season 2 will shift the focus from urban California to suburban Indiana, and instead of a murder, the crime in question will center on a student who accuses members of his private school's basketball team of sexual assault. "Pretty much everything about it will be wildly different," King says about the new season. "It definitely feels like a different world. It's a little more open ... it's a little shinier, if that makes sense. Because you're dealing with people who are more affluent than the characters that were in Season 1. They're people that are probably more successful, a little more corporate." One of those "shiny" new characters is King's Terri Lacroix, the mother of a basketball player accused of sexual assault. When I ask if audiences will still be able to identify with these more "affluent" and "corporate" characters, King explains, "I think probably even more so because it's more mainstream TV. One of the things that was very interesting about [Season 1] was all of those characters and the way we all looked — you don't see those people on network television during primetime hours. These people you see more often on TV, but you don't see this subject matter that we're dealing with in Season 2." The actress identifies that facet as being the sole connective tissue between the two seasons: "It's still dealing with subject matter that is not usually discussed." If you missed out on American Crime Season 1, don't worry. Since it is an anthology show, there's no catching up required before diving into Season 2. "You do not need to know anything about the first season," King assures potential viewers. But the new season should be extra rewarding for returning fans: "For anyone that was moved in Season 1, they will continue to be moved because this subject matter is, I think, even more sensitive than last season since we're talking about kids in high school." Another bonus for veteran watchers will be getting to see the talented cast inhabit entirely new roles. "For those [actors] that were with Season 1, we all look and feel and move and carry ourselves so much differently: Felicity, Tim, Elvis, Richard, and myself, coming into Season 2," King says. "That's going to be very intriguing for those that followed Season 1, just to see us as totally different people — visually, physically. I think that is gonna be exciting." Between her Emmy victory and being a series regular on two thought-provoking dramas, American Crime and The Leftovers, simultaneously, King is experiencing something of a career high. "I couldn't be more elated to be doing two shows that are so provocative and so emotionally driven," she says. "As an actor, you don't always get lucky enough to do one, let alone two at the same time. So sometimes I kind of pinch myself like, 'Look at you, little miss thing. Look at you.' And now an Emmy! Good stuff." With the weight of an Emmy win behind it, hopefully more viewers will seek out American Crime in its second season. Whether you're tuning in for the first time or coming back for more, the ABC series will return to address important new issues in a riveting way on Wednesday, Jan. 6 at 10 p.m.